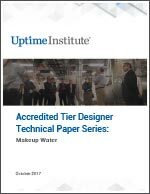 Abstract - This technical paper provides a summary and follow-up to questions and discussion during the Accredited Tier Designer curriculum presentations in September 2009 concerning alternate sources of water necessary to sustain operation of evaporative condenser water towers. Consistent with the concept that the loss of Public Utility electrical power is a design condition rather than a failure mode, the loss of the Public Utility domestic water must also be addressed as a design condition. As with many Tier-based design considerations, providing a Concurrently Maintainable source of water for evaporative cooling towers can be accomplished through adaptation of traditional design solutions rather than inclusion of unique or complex design elements. This paper demonstrates that meeting the requirement to provide on-site storage of makeup water for evaporative cooling towers is in fact a straightforward and manageable solution.